Registration for the 2018-19 season (August 2018-July 2019) will open on June 1, 2018. Look for information from your Team Manager soon. 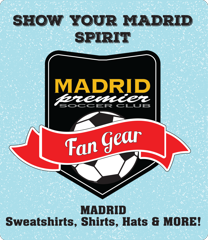 Bring your team to the Madrid Premier Soccer Club! There are still opportunities to join and/or train with Madrid. Contact the Director of Coaching & Player Development at doc@madridpremier.orgto discuss placing you on the right team. The bad ... Spent the weekend in Temecula. Really physical games. Last game ended after 7 PM on Sunday. The good ... Scored all the goals (1 own goal) and conceded none. Off to Lancaster. ©2019 Madrid Premier Soccer Club / SportsEngine. All Rights Reserved.